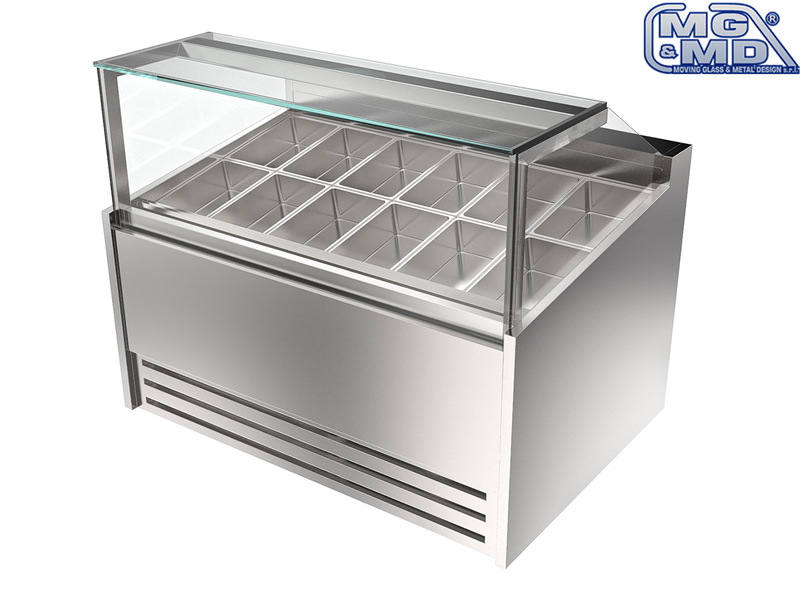 “Oasi” model display case is realized for satisfy the most specific needs for furnishing of professional ice cream shop. Its big depth allows to fit, into the tank, 5,8 or 10 litres ice cream containers obtaining an important visual impact to the customer side. The refrigerating system with two evaporators permits the right ice cream preservation (also for home-made ice cream). The stainless steel tank is insulated by low-density ecological polyurethane. With R452 A-valve ventilated evaporator system. stainless steel work surface. With heated and frontal opening glass by vasistas system, downwards. Top shelf with led light and engines connected as standard.